If there’s something you don’t like about the way Lync tries to get your attention, chances are you can change it. For instance, if you find that you’re missing instant messaging (IM) alert requests, you can do several things to make them harder to miss. On the other hand, if the sound alerts that Lync sends are a nuisance for you, you can turn them off. If you’re really busy, you can turn off alerts from everyone except your key contacts. And if you don’t care to know when someone has added you as a contact, you can opt out of that alert process. Note: For details about how to respond to incoming IM alerts, see Use Skype for Business (Lync) IM. Set your display so Lync will always be in the foreground: click the drop-down arrow next to the Options button , click Tools, and then click Always on Top. Confirm that Lync is set to send audible alerts: click the Options button, click Ringtones and Sounds, select the Play sounds in Lync (including ringtones for incoming calls and IM alerts) check box, and confirm that the other check boxes in the panel are not selected. If you use multiple display monitors, make a practice of moving your Lync main window onto the monitor you’re working in. Open Ringtones and Sounds options, click the Sounds Settings button, and then click the Sounds tab. Drag the slider on the Program Events display panel down to the Lync listings. Click Incoming IM. The Sounds display at bottom of the window should read LYNC_iminvite.wav. To set up custom alerts for communications other than instant messages, go back to step c, click a Lync communication mode other than Incoming Instant Message (for example, Incoming Call, Incoming Video Call, Incoming Team Call), and then complete steps d and e for that type of communication. 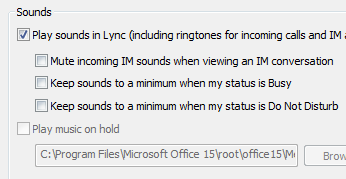 In the Lync main window, click the Options button, click Ringtones and Sounds, and then, under Sounds, clear the Play sounds in Lync (including ringtones for incoming calls and IM alerts) check box. When you’re really busy, setting your status as Do Not Disturb is handy for reducing the number of interruptions you get. But you might still want to keep in touch with important contacts. You can make exceptions for contacts to who you’ve assigned the Workgroup relationship to (typically your closest co-workers). To hide all Lync alerts so that you cannot be interrupted when your status is set to Do Not Disturb, click Don’t show alerts. To see only conversation invitations from Workgroup members and hide all other alerts when your status is set to Do Not Disturb, click Show only conversation alerts from people in my Workgroup privacy relationship. To see all alerts, but limit conversation invitations to those sent by Workgroup members when your status is set to Do Not Disturb, click Show all alerts, but only conversation alerts from people in my Workgroup privacy relationship. By default, when someone adds you as a contact, Lync will add them to a running list of people you might consider adding to your Contacts list. You can review this list by clicking the New tab on the contacts view of the Lync main window. Decide who to add to your Contacts list, and assign privacy relationships and group memberships to those new contacts. Click the Options button, click Alerts, and then clear the Tell me when someone adds me to his or her contact list check box.